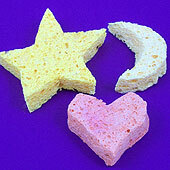 Do you know that ordinary kitchen sponges can be used to make stamps? 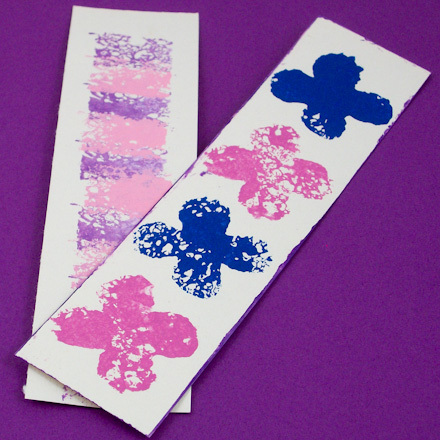 These stamps can be used to decorate wrapping paper, party invitations, or greeting cards. Children will want to make a variety of stamps to create artistic masterpieces for display in the refrigerator door gallery. Follow these simple instructions, and you will be able to make stamps of your own design in minutes. 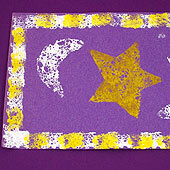 Doing sponge art is great for family, classroom or group craft time. It requires just a little preparation by the adult or teen group leader. If you plan to do sponge stamps and art with a group of children, be sure to have paper, sponges and plastic lids for each child. Other tools and materials can be shared. You can cut sponges in half so each child can have one. 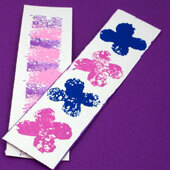 Print these stamp patterns, make a pattern by printing some clip-art, or draw a design on paper. A simple outline design works best. 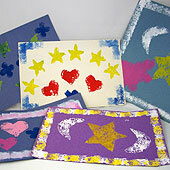 For smaller stamps, try a star, a heart, a diamond, or a cross. Animal shapes are good for larger stamps—teddy bear, hippo, or fish. Cut on the outline around the stamp pattern of your choice. Wet an unused kitchen sponge and wring out as much water as possible. Place the pattern on the sponge and trace around it with the marker. Using a good pair of scissors, cut the sponge on the trace line. Kids may need help with this step. Pour a small amount of paint onto a plastic lid or plastic plate that is larger than the stamp. The paints can be used straight from the tube or jar, but the result may be too dark. Thin the paint with white paint, if needed. Regular stamp pads may be used with the smaller stamps. Wet the sponge stamps with water and wring them out as much as you can—the sponge just needs to be damp. Dab the stamp up and down in the paint to spread the paint out in the plastic lid. Spread the paint to the size of the stamp. With the stamp loaded with paint, but not dripping wet, press the stamp on the paper with even pressure. You can use the stamp multiple times without reloading it with paint. Tip: Instead of dabbing the stamps into paint, brush paint directly onto your sponge stamp. You can paint different parts of the stamp with different colors! This is a good technique to use when making a small number of impressions with your stamp, or when using multiple colors on one stamp. Tip: It's a good idea to test your stamp on scrap paper before using it. If the stamped image is missing parts of the stamp, it might not have been fully loaded with paint. If the shape isn't quite right, you can wash the sponge stamp out with water and make cuts to correct the problems. 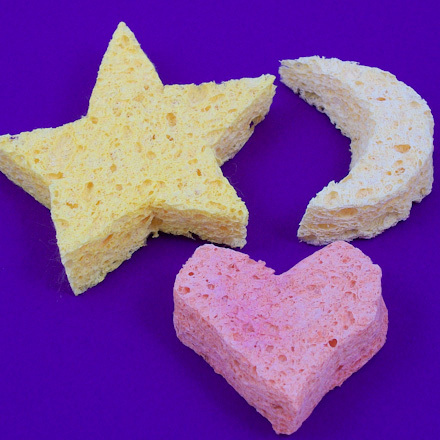 To cleanup, wash your sponge stamps and plastic lids with water and a little liquid soap. Let them dry before storing. Be sure to dampen the stamps before using them again. That's it! Your sponge painting is ready for display! 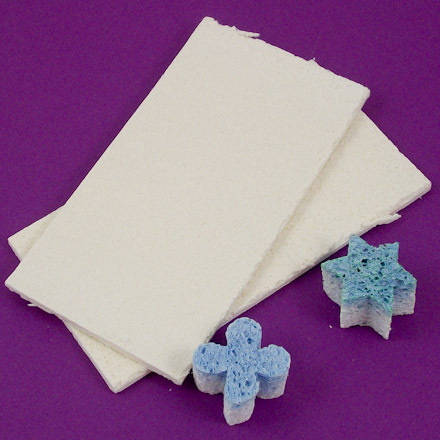 Tip: Craft stores sell compressed sponges for stamp-making. This material is harder to cut (requires heavy shears), but allows for more detailed patterns. Also, the sponge is more finely grained than a kitchen sponge. 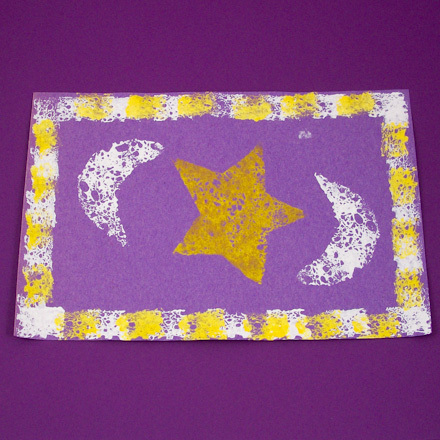 Tip: Sponge art works well on various colors of construction paper. Tip: Strips of construction paper stamped with small sponge stamps make nice bookmarks. 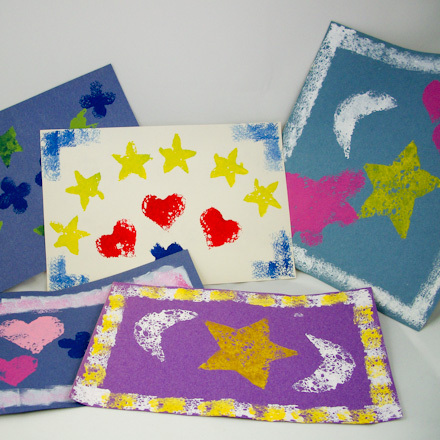 Tip: Sponge stamps have an airy texture that allows the color of the paper to show through.